Help! Which software can I use with mixed devices or Chromebooks? In the past few years, a large number of schools worldwide have decided to adopt a Bring Your Own Device (BYOD) approach to technology for students meaning that students can choose to use a Mac laptop, a Windows laptop, an iPad or an Android tablet. At the same time, a number of schools have selected Chromebooks – which only allow the user to access resources and software that are online and “in the cloud” – as the technology device of choice for their students. And still other schools find themselves with a variety of technology devices – perhaps iPads in elementary school, Windows laptops for senior students, Chromebooks for middle school and a Mac lab down the hall! What’s the best approach in this situation? What software can you use that will work across all – or at least most – of those devices? The solution is to use cloud-based software and interactive websites. In case you’re new to the concept (or not sure quite what the term means), cloud-based software is software that you access via a web browser (ie. by going to a website). You don’t download anything onto your computer hard drive at all. The software lives “in the cloud” – it is online. This type of software is necessary for Chromebooks because they are designed only to access the internet and online resources: you cannot download and install any software on them. Cloud-based software is also the ideal solution for BYOD schools for the same reason because it accessible online, via a web browser but there are some other benefits too. You never need to update the software yourself. Ever. Updates happen on the back end of the website and are handled by the software creator. It makes your school IT person VERY happy. The software can be accessed (almost) anywhere there is an internet connection. This means a student can log into their Noteflight notation software account at school and start their assignment. They can then go home and log in to the same account on their iPad at home and continue their work. No need to send files via email or to save to Dropbox or on to a flash drive in order to transfer them from one device to another. Provided you have an education account, you – the teacher – can usually access student projects simply by logging into your own central account which allows you to view and assess the work anywhere you have an internet connection. Cloud-based software that involves saving a project will usually require you and the students to log in to the website. Projects are saved to each user account. Some (but not all) of the cloud-based software works on iPads, as well as laptop and desktop computers and Android devices. Generally speaking, those that do not currently work on all platforms are being updated so that they will work some time in the near future. In most cases, music/audio online software and interactive websites work best using the Google Chrome browser. If you’re using a different browser and things are not working as expected, switch to Chrome and try it there. Related: Why won’t that music website load? Fully-featured software – this is software that is comparable to the desktop software (such as GarageBand, Mixcraft, Sibelius, Finale) you might have used in the past. This type of software has a large feature set, allows the user to save projects and offers multiple options for exporting work. Interactive websites – this is my own descriptive word because I haven’t come across a better term! These are interactive musical websites that allow you to create, record, compose or learn music but that mostly have a single focus and are not as fully-featured as the software in the first category. This list includes fully-functioning software programs that can replace “download and install” software such as GarageBand, Sibelius, Finale, Mixcraft and so on. In a separate list below you will find some of the lighter-weight interactive websites. Please note that some of these do not work on ALL devices. Here is a list of some creative music resources that work well when introducing or reinforcing concepts, or when used alongside or in conjunction with the resources listed above. Thanks Adrian. I toyed with the idea of including this category! They’re great suggestions. Noteflight can replace Finale? Since when? I’ve had Noteflight’s pro version (Crescendo) before, and it’s still nothing compared to even primitive versions of competent SmartMusic software. For younger students (elementary through to middle school), Noteflight can definitely replace Finale. I think it’s the best option for students up to around year 8 or so at school. When they are in the upper grades of school and heading into tertiary studies -ie. specialising in composing and arranging and/or looking at music as a career choice – Finale or Sibelius are the best options. Also – for teachers who are composing or arranging themselves (ensemble arrangements, worksheets, film scoring and so on) I also think Finale or Sibelius are the best options. I personally use Sibelius, but – like Finale – the feature set is overkill for elementary and middle school students. Besides – the purpose of this article was outline the options that work across all or most devices. 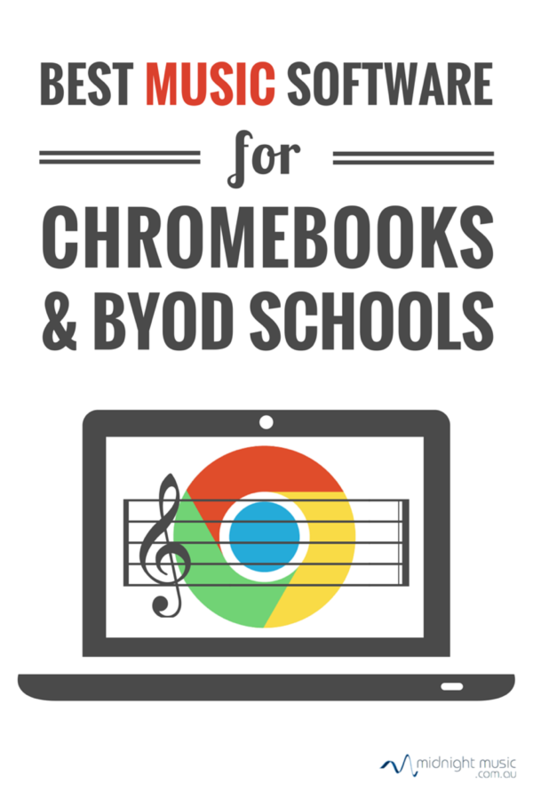 Sibelius and Finale do not have cloud versions or iPad app versions that allow you to create or edit scores so they are not a viable choice for schools with a BYOD policy and/or Chromebooks. We’re happy to say that our two award-winning products, Breezin’ Thru Theory and Breezin’ Thru Composing, are fantastic on Chromebooks! We’d love it if you could add them to your list. Also, with our upcoming new release, Breezin’ Thru Theory ‘Next Gen’, all our products will work on ANY device. Let me know if you would like a personal online tour of our products. I’d love to show you what we have. When are Auralia and Musition going to release versions that will work on Chromebooks? I believe they’re working on it at the moment, but I’m not sure there’s a specific release date yet. You could contact Rising Software directly to check? Hi Katie, I tried going to Soundation via your link but both links that that you to the Music First websites are telling me that the link is broken. Perhaps the website address has changed? Perhaps something to look at? Thanks. Hello. I have a chrome book & just want a place to store tracks that I can then mix etc. (Very basically) Would this work for me?